Scrum projects are tiring, because it’s hard work to maintain continuous improvement, sprint after sprint. That’s why it helps to talk to other people about how they do it: each new idea, insight and technique is a new opportunity to improve. Scrum tools are low-tech, so it’s a rare treat to see innovation in the basic hardware. In case you didn’t realise, there’s now a better kind of Post-it note. Every Scrum practitioner has suffered that awkward moment when masterful Scrum board Post-it repositioning is immediately followed by it falling off and landing on the floor. Unfortunately, Post-it notes don’t stick to whiteboards very well. This is also annoying when it happens while no-one is watching and no-one can remember where the note goes (which is, incidentally, a bad sign). There are various possible solutions to this problem. Accept the problem, and use regular photographic backups as a work-around. Use flip-chart sheets instead of a whiteboard for the Scrum board. Learn to apply Correct Post-it Technique (CPT). 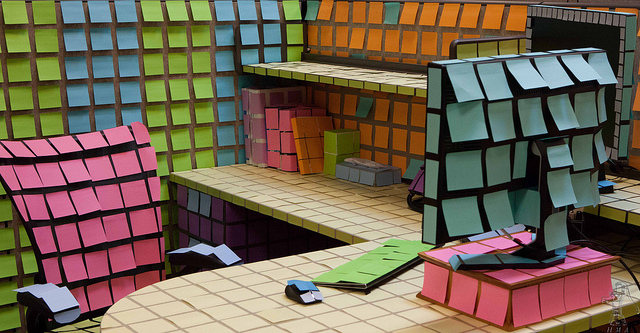 Invent a new kind of Post-it note. It turns out that while Scrum masters, world-wide, were struggling with the first two or three of these, 3M have indeed invented a new kind of Post-it note: one that sticks. Perfect for vertical and hard to stick to surfaces. They make your work effective & simplifies your everyday life. This is all rather ironic, if you consider that Post-it notes were originally accidentally invented by a scientist who was trying to develop a strong adhesive, and failed in an interesting and useful way. Despite the irony, Super Sticky Post-it notes sound great: I shall insist on them for my next Scrum project, along with product owner training and senior management buy-in. Otherwise, I may have to stick with CPT. If your Post-it notes fall of the whiteboard, it’s probably your fault. As with many aspects of Scrum, even the things that look simple require some technique. To tell if you don’t have Correct Post-it Technique, remove a Post-it from the pad and observe its shape. If the Post-it is now curled then you’re doing it wrong. When the sticky part of the Post-it note is curled, the curl pulls most of the sticky area away from the whiteboard, and the note falls off. The result of Correct Post-it Technique is a Post-it note that remains completely flat, even after removal from the pad. A flat Post-it will present maximum sticky area to a vertical surface, and stay on longer. Opportunity to demonstrate Correct Post-it Technique in order to suggest superior agile coaching expertise. Correct Post-it Technique is surprisingly rare. It is the secret handshake of the agile community.